Jason Anders: When I was a kid, I had this little wind-up Q*bert toy that was my favorite thing in the world. At some point I lost it and I made my dad completely turn our garage upside down looking for it. I never found it and it was the most devastating thing to happen in my life up to that point. Warren Davis: I'm thankful for your Q*bert obsession. Certainly back in the day when Q*bert was new, it wasn't surprising to meet people who liked the game and were very appreciative. It was a reward for me when people enjoyed the game. In the 90s came this nostalgia for arcade games which was astonishing to those of us in the industry, we never thought that would happen. Nowadays it's really mixed because there's so many people who weren't alive for those early arcade games and have never heard of them. 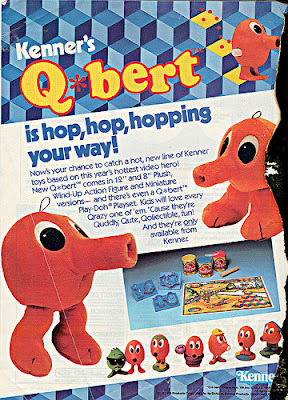 Of course they've heard of Pac-Man and Frogger, but Q*bert is one of those that doesn't quite get remembered as much. 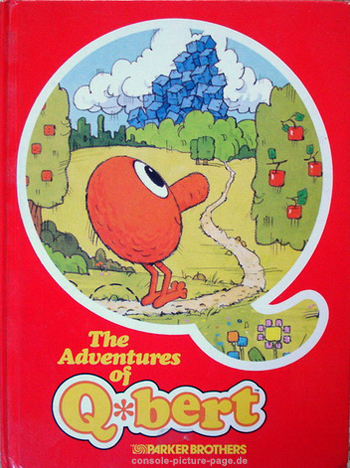 Sometimes I run into people who say "I love Q*bert!" and others who say "what's that?" It keeps you humble. JA: Do you remember what inspired the look and design? WD: They came from the mind of graphic artist Jeff Lee. He created all of those characters for some other game. Generally, back in those days, programmers were the game designers. At Gottlieb it was the programmers who were really considered to be the project leads and people in charge. Jeff was the only artist for every game. The artist was there as a support person to provide the graphic you needed. 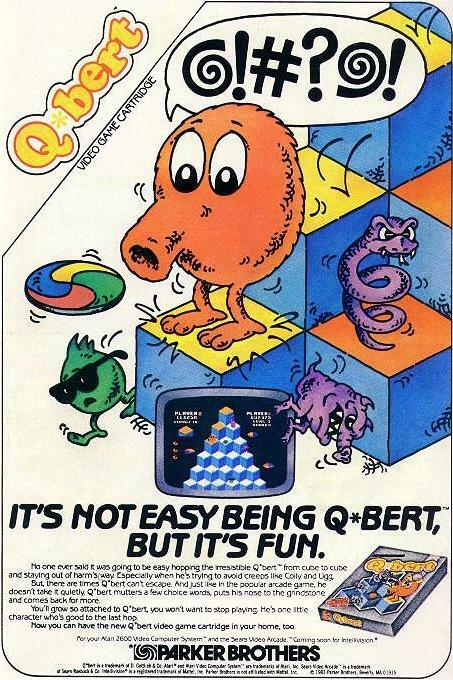 The whole beginning of Q*bert was an evolutionary experience. I was a new guy at Gottlieb and this was my first job in video games, and I had worked as a support programmer on another game. I had also worked on the diagnostics software that was built into each arcade cabinet so that the operator could run tests. I had paid my dues in a sense, learning the hardware, and had sort of learned what was going on. It was time for me to come up with a concept... which I didn't have. What I did have was this inspiration of seeing somebody else working on this Escher pattern, where they filled the screen with it and it looked like a screen full of cubes. When I looked at it, in my mind's eye I saw this pyramid where you had a random path for each ball to drop... basically looking at it as a programming exercise. So it starts with a pyramid, and balls bouncing down it. Once I figured that out and got it working, the next question was about having a player character jumping around in this play field. That's when I went to Jeff and asked if he had characters I could use. He showed me all these characters he had created for a game no one had been interested in, and I said "do you mind if I use that guy with the long nose?" In Jeff's mind this guy had a long nose because he was going to shoot things out of it. I wasn't interested in a character that could shoot things out of its nose, I just needed him to jump around on the pyramid. Ugg and Wrong-Way, who would come from different angles (who's gravity was different than Q*bert's by the way), also came before any kind of game element. These characters all came from Jeff's crazy mind, there were no character descriptions when the game started. JA: At what point in life does the split happen in your mind that you become both interested in the technical side of video game design as well as becoming an actor? WD: I will say that as a kid I was outgoing, but I had no aspirations to become an actor. I don't think that ever entered my mind. What I did have a desire to be was a filmmaker, and as a teenager I used to make Super 8 films. I was also a big lover of monster movies and actually learned how to do all sorts of monster makeup... I bought the kits and transformed myself into a werewolf, mummy, and a vampire and we made movies about it. I acted in these movies but it wasn't because of my desire to be an actor, it was because of my desire to be a filmmaker. I directed films with my friends in high school as well, but had no desire to join the drama club. When it came to college I had two choices in mind as a career path, filmmaking or computers. I ran a computer in my high school at the time which was the size of a full desk back before the PC had been invented. My parents and guidance counselor steered me towards computers because filmmaking was not a real career. In college there was a theater club that put on some really amazing productions and had some really talented people involved, including my friend. He dragged me to an audition my senior year and I ended up getting cast and having the most amazing time. To step out on stage and get the applause during the curtain call is the most incredible feeling. It's kind of like a drug. I didn't take acting serious as a career, though... I just did it for fun. As I started my career as an engineer I moved around from town to town, and wherever I went I tried getting involved in the local community theater scene. I eventually realized engineering wasn't for me and I quit my job living in suburban Illinois just outside of Chicago - I wanted to join Second City and started taking improv classes. I basically became an unemployed improv actor, and I started constantly checking the want ads for engineering jobs. Eventually, Gottlieb advertised a job for a video game programmer... I almost didn't want to do it, I wrestled with it because I had made this commitment to start performing with a comedy group because I really thought that's where my future was going to be. I decided "what the hell" and applied. I got that job and also continued doing improv comedy, I even eventually took a two-year acting class around the same time that I started at Gottlieb, so I was on a dual track from the beginning. JA: How involved did you get with Second City? WD: Nowadays there's a Second City training center, back then it didn't exist and if you wanted to get on stage you had to take classes at a place called the The Player's Workshop of Second City. That's where I ended up studying, I completed it and did a couple of children's shows on their stage. After that I got together with a few friends and we started performing improv and sketch comedy at different venues in Chicago. I never really tried to get into the Second City company. It became too much about who's funnier. It's not supposed to be about that, improv is about making the other person look good. It's about teamwork. JA: Who were your favorite comedians who originally made you want to do improv? WD: It was around 1978 when I first came to Chicago there were people like Mary Gross and George Wendt who were unknowns and working on the Second City stage. Shelley Long had just studied there a couple years earlier. I loved watching them work because they were hysterically funny and I admired what they did. JA: Did you get the same fulfillment from making video games that you felt from being on the stage? WD: Yes, absolutely. It was very satisfying. When I was in college was when Pong, Space War, and all those early black & white arcade games came out. Space Invaders, Tank, Missile Command, and Breakout were all games that I played in the arcades as more of them were springing up. And of course you had Pac-Man which took the characters to color and made them more cartoony, and it really started to evolve. The idea of making video games really appealed to me as a computer engineer, but I thought it would really be a dream job that you'd have to be a genius to land. For some reason I just felt that was out of my grasp. It was a complete shock to see that ad in the paper looking for video game programmers. When Q*bert got to the testing stage they would put out a generic mock-up cabinet in an arcade and people would play it with us there. To see people come and really enjoy the game that you've just created, even though it's anonymous and they don't know who you are, it's incredibly rewarding. It's kind of the same as getting that applause at the end of a play. JA: Just like you find the Universal Monsters classic I think most gamers find Q*bert iconic in the same way. Even the Guinness Book of World Records ranked the game in the top 20 for technical, creative and cultural impact. WD: I didn't know that! Electronic Gaming Monthly a few years ago came out with a list of the top 200 games of their time, and Q*bert was on the cover of the magazine in a collage of characters, but he wasn't on the list! I was stunned because it was one of the top games of its time. JA: It also spawned every toy imaginable, he even had his own cartoon on CBS. 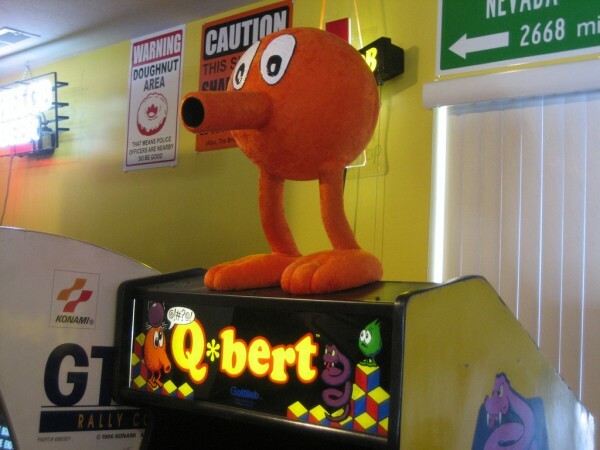 WD: Anything that enhanced Q*bert's standing in the public I thought was a good thing. Gottlieb was really on top of marketing and merchandising, and I really thought that was astonishing. As far as the cartoon itself, somebody had to give it a story. We weren't involved in that in any way, and I didn't spend a whole lot of time watching it. 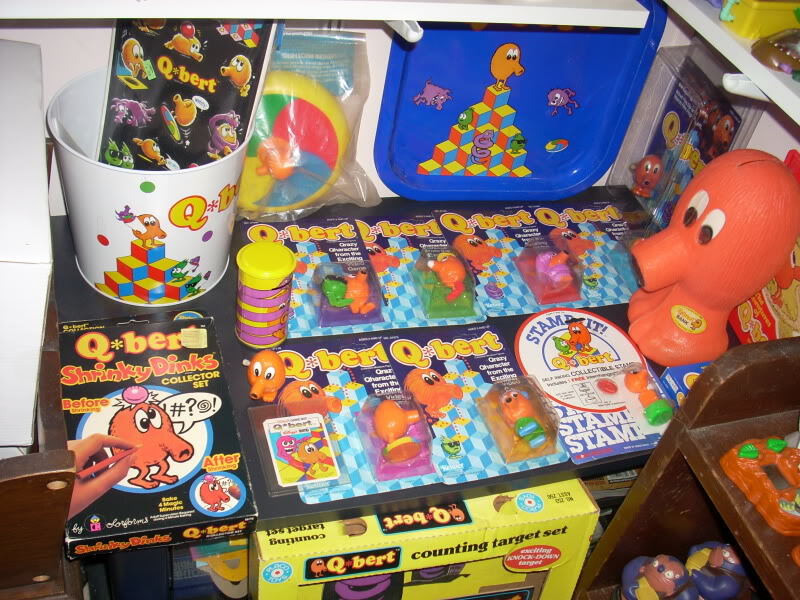 JA: Do you have any of the old Q*bert merchandise in your house? WD: I have one of the engineering cabinets, so I have the arcade game. I also have a Q*bert plush toy. At one point I had a lot more stuff, and I have no idea where it disappeared to. JA: Did you ever play any of the new Q*bert games they made, like Q*bert 3 for Super Nintendo? WD: I know that Jeff Lee was involved in a few of those games, but I had never been involved in any of them. He was an artist for the SNES one. There was some sort of trade show that I went to where I ran into some people from Hasbro and they were talking about doing a PC version of the game. They told me they wanted me to be involved, but what I think they meant is that they wanted me to just give it their blessing. Nothing really came about me being involved in the subsequent versions. I do believe, though, that I was the person who told Sony that they owned the rights to Q*bert at another trade show for games. 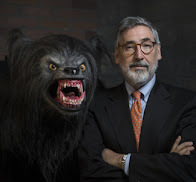 Gottlieb was owned by Columbia Pictures, and Columbia was bought by Sony, and they didn't realize before then that they owned the rights. JA: So tell me the story behind Q*bert's speech balloon. WD: David Thiel, who was the sound designer, had this voice chip. The state of the art of voice chips at the time were these things that basically put out phonemes. As a programmer you had to string together the phonemes in order to make words. It sounded terrible, and Dave thought it sounded terrible. 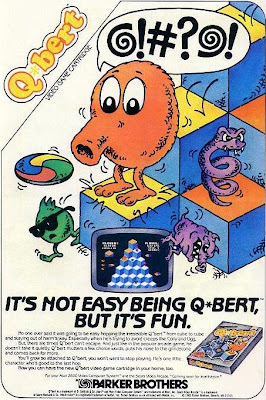 Rather than have Q*bert actually say things in this crazy, mechanical, unrealistic voice, he thought it would be funnier if he spoke in random gibberish. Basically whenever Q*bert speaks it's just randomly putting phonemes together. The odds of him saying something offensive are pretty low, but not zero. There was no real public outcry about it. JA: I've read that you weren't able to collect royalties on Q*bert? WD: There were no royalty programs in place at Gottlieb, and no one expected there to be because there never had been. After Q*bert Gottlieb released M.A.C.H. 3 on laserdisc and it was very successful, and the company decided to put a royalty program in place. The problem was that it was not retroactive. Q*bert was not part of that... however, if it were, I've been told that I would have earned $100,000.00 in royalties. They wanted to do right by me and they gave me a $20,000.00 bonus, I was young and just starting a family and that was a lot of money to me. It's only money. JA: What can you tell me about Faster, Harder, More Challenging Q*bert? WD: We developed Q*bert in 1982 and they went into production at the very end of the year, it was filtered into arcades mostly in 1983. In the tuning of the game a lot of people at Gottlieb found it very hard. The initial response from people in arcades was that is was really hard, so I started tuning it making it easier and easier so that people wouldn't be angered by it or lose their quarters too fast. It became clear once it was released that some people could just play it for hours upon hours. It became clear that it might be hard in the beginning, but once people get the hang of it it becomes too easy. My response to that was to basically create a retooled version where we restructured the levels and we added one character who was a replacement for Coily the snake - basically it was a female version of Q*bert who would chase after him because she loved him, she had little hearts coming out of her. The discs were no longer stationary, they would move off the pyramid. When people would ask me what the point of having this new version of the game was when I had a successful version already in the arcade I would just say that it's faster, harder, and more challenging... so that's what we eventually called it. We didn't want to call it Super Q*bert or Q*bert 2, those sounded too pedestrian... we had a sense of humor back then. We actually did put it out into arcades but it was too soon. People found it too hard and it was competing with the original game that was still in arcades and doing well. I thought we could just hold onto it and release it a year later, I don't know why that didn't happen. Everybody just moved onto different things, but it was always my favorite. 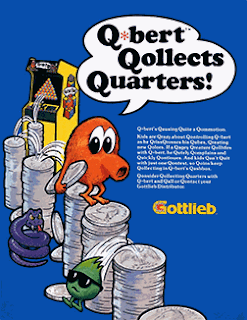 I had the roms for it in my Q*bert cabinet back home, and it stayed there for about fifteen years or so and in the 90s while working at Disney I came across MAME (Multiple Arcade Machine Emulator) where you could play these arcade games on your PC. It wasn't just a version of it, they emulated the hardware so that you were playing the actual roms. They had done an emulator for the Q*bert hardware, so I gave them Faster, Harder, More Challenging and they released it, so now it's available to the public. I feel very good that it finally got released. JA: Do you ever get tired of people asking you about Q*bert? WD: I don't, but that's because it doesn't happen that often. I don't get to talk about it that often so I'm very happy to talk about it when the opportunities arise. Once every year or two I'll get an interview request. I'm very proud of it and gratified that something I did so long ago is still being considered relevant. It's been 30 years almost! It's so astonishing to me and I'm very grateful for the response to it. 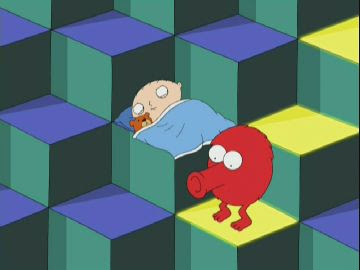 JA: Did you ever see the Q*bert reference on Family Guy? WD: Wait a minute, I've only seen The Simpsons reference, I didn't realize Family Guy did one as well! JA: So what are you working on at the moment? WD: I'm doing a lot of things, honestly. I do love acting so I'm doing that, also some stage directing as well as some film directing. I'd like to go back and become a little bit of a filmmaker now that it's done so much on computers, that's sort of what I've been waiting for all my life. I've been dabbling in it the past few years making short films. I also have been doing some software projects as they come up and interest me. I'm not particularly interested in where the gaming industry has gone, but every once in a while I have ideas that I think might be worth exploring. One of the nice things that Q*bert has done for me is that I don't have that burning need to prove myself. 'm not hungry, but I've also never been a hugely ambitious person. It's unclear what the future holds for me, and right now I am just indulging myself and doing things for fun. JA: What would you say are three of your favorite movies of all time? WD: I think Casablanca is one of the most amazing films ever made. It's a timeless film that speaks to every generation. I love the Marx Brothers, Star Wars, The Silent Partner... I'd have to think for hours to pick just three. I also love a film called The Stunt Man from 1980. It's a strange little movie that spoke to me in a huge way. It seems like such an unconventional film but it works on so many levels. I was very fortunate in that I got to meet the director of that movie, Richard Rush. I did a 72-hour filmmaking competition where you have to write, cast, shoot, edit, score, and come back with a finished movie three days later - I did this with a bunch of friends and we won first prize. Richard Rush was one of the judges. We weren't supposed to talk to him, but I told him what a fan I was and he invited me to sit down and talk with him for about twenty minutes. It was amazing because I just admired what he did so much. JA: What key moment stands out to you since the release of Q*bert as being the most special in terms of reference to what you created? WD: My fondest memory would be the first time I saw it referenced outside of the video game world, and that was in a movie called Moscow on the Hudson with Robin Williams. In this movie Robin Williams' character is sort of dejected or sad, and he's playing Q*bert. You see Q*bert jump off the pyramid. I didn't know that was coming and was just like "oh my God! ", it was kind of a shocker in a good way. JA: And my last question, do you ever pop out NBA JAM: Tournament Edition and play as yourself? WD: It's funny you mention that, the last time I did that was in New Hampshire two years ago visiting the biggest arcade in the world, and they had every one of my games. I saw some games there that I had not seen in years! The Us vs. Them laserdisc game, Joust 2 which I hadn't seen in years, and NBA JAM: Tournament Edition. That was the last time I played as myself, and my God I've aged. People in arcades were always blown away when I would pull up a player with my head, I had a lot of fun with that back in those days. JA: I used to always play your Aerosmith game, Revolution X, at the movie theater arcade as a kid. WD: Having Aerosmith come to our offices and blue screen studio was an amazing blast! We shot a behind-the-scenes video of them for that day which was cut into a promotional video. I was doing the clapboard that day. The most surreal moment that day was standing at the urinal next to Tom Hamilton and we're chatting. They were such awesome people, great to hang out with, and a lot of fun. All the guys were calling up their girlfriends and passing the phone to Steven Tyler. It was a real fun time.